I turned 5 years old on December 19, 2010. That was my birthday. 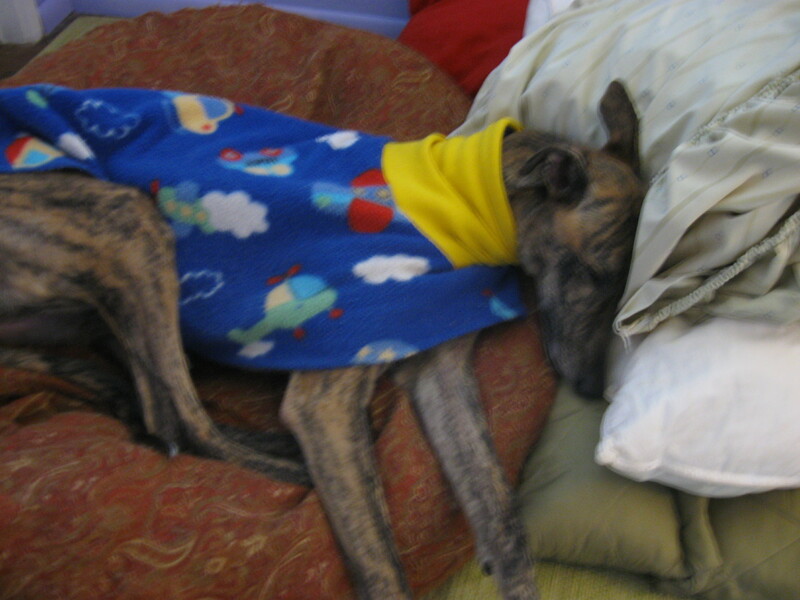 I heard through the greyhound grapevine that I’m supposed to be lavished with presents but that did not happen. My human did make me chicken soup with smashed carrots and rice and I ate that for four days. It was heavenly. I was supposed to get a new collar but that didn’t happen either. My human said I’m getting one soon. Then another hound came to stay for awhile. His name was Carter and he was a cool guy after we growled at each other a few times. I was trying to dominate him and he wouldn’t let me. He stayed for 8 days while his foster mom went to Texas. When he left, Karyn stood at the door weeping and I whimpered. A few hours after he left, Mary Jo came. She is Karyn’s best friend. She’s fun. I slept with her every night. She didn’t mind and we cuddled. Lots of people came to visit when she was here. The house was full of laughter and pets and treats. After she left it was kind of depressing but my Karyn is just so busy, so unorganized, and so forgetful. 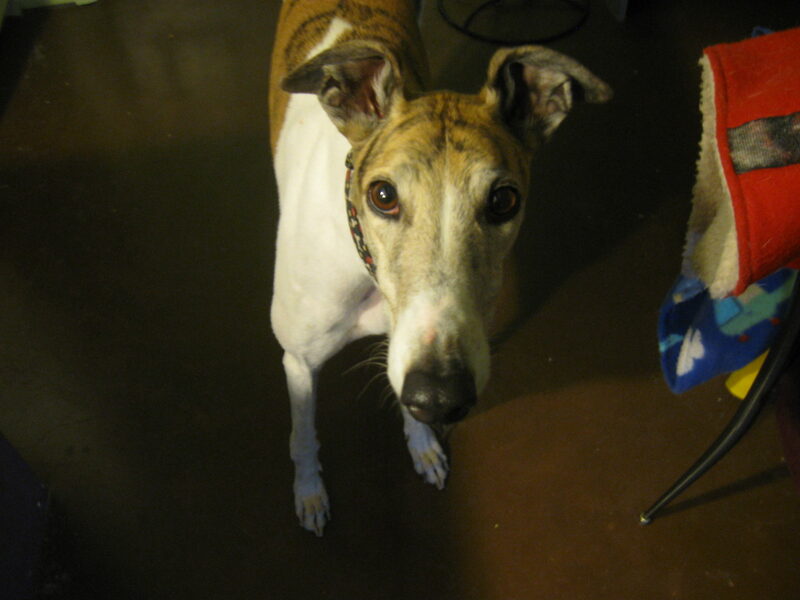 A couple weeks ago Auntie Glenda came and brought her two greyhounds Beamer and Anabel. I think Karyn forgot to take photos. Beamer is a big boy and marked in the living room. Not cool Beams! Then we all went outside. I think I’m in love with Anabel. She’s a fiery wench. She and I did the tango two times until Beamer broke it up. Chill Beamer! You live with her. I’m only trying to make some time with her. I would like Anabel to come and visit again and leave Beamer at home. We must tango some more. Our clicker trainer came to a halt because Karyn was too busy but I think we’re going to start up again. The other day on our walk Karyn couldn’t keep up with me and missed the curb and fell. She dropped the leash and I started off without her. Fortunately, for her I know “Jett COME!” and I came back and she grabbed my leash. I just stood there counting the minutes until she could get up. She was saying some bad words as she tried to stand up. Her elbow was bleeding too. But she’s a trooper or so they say, and we finished the walk instead of turning around, as the show must go on. I’m hoping to have some new adventures soon and perhaps I’ll meet you too. Jett, you are a handsome boy! Belated Happy Birthday to you. Happy Birthday, Jett! I can’t wait for you to meet Gordon, Jenny and Sunny-D! You have a very special mama,take care of her!